Yarn and Fiber Happenings: Giant Pumpkins and a Sale on Prism Yarns, Queensland Yarns and Jaeger Yarns at the Yarn and Fiber Fall Sale Spooktacular! Giant Pumpkins and a Sale on Prism Yarns, Queensland Yarns and Jaeger Yarns at the Yarn and Fiber Fall Sale Spooktacular! What's on Sale Today? 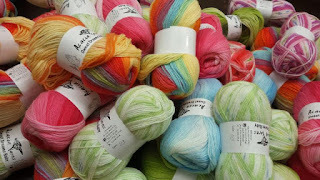 Prism Yarns, Queensland Yarns and Jaeger Yarns at the Yarn and Fiber Fall Sale Spooktacular! Hooked on the Salem Witch Trials? Can't get enough of the gloom and doom? Well, to keep everyone on their toes, a quick break from Salem Village in 1692 and to the year 2008 in Topsfield MA at the Topsfield Fairgrounds. Note: This material may be upsetting if you suffer from a fear of jack-o-lanterns. So, what can be as interesting as the Salem Witch Trials? The Giant Pumpkin competition of course! Every year at the Topsfield Fair in Massachusetts, members of the New England Pumpkin Growers Association of New England (http://www.bigpumpkins.com/) gather and compete to try win first prize for the heaviest pumpkin for the year but also to beat the current world record (1689 lbs in September of 2007. This was more fun than you can imagine! Pumpkins begin arriving as early as 6:00 AM and the weigh-off starts promptly at 8:30 AM. Now imagine walking into a giant arena and it is filled with giant pumpkins... breathtaking! Forklifts and burly men worked very hard - and smiled all the time (the were having too much fun lifting these pumpkins) - bringing the pumpkins from their resting pallets to the scales. These babies were enourmous! My favorite pumpkin, which I spotted the moment I sat down (really shiny and quite pretty) actually won the prize for the Prettiest Pumpkin! I clapped and cheered ... this was really a fun event to attend. Here she is on her way to receiving her prize. Everytime they would put a pumpkin on a scale, all eyes would go to the weight reader and I swear no one would breathe until the reader stopped.. Then whoops and claps would break out - a good time was has by all! The winner of this years competition is shown below - a whooping 1484 lbs.... that's a lot of pumpkin pie! The Topsfield Fair be open until the evening of Monday, October 13. The winner of the giant pumpkin contest is displayed in the Fruits and Vegetables building. They also sell giant pumpkin seeds in this building - good luck if you decide to try to grow one! Dream in Color Oakleaf 3/4 Shawl designed by Karen Joan Raz uses 2 skeins of Dream in Color Baby Lace weight yarn and a US size 5 - 32 inch circular needle. 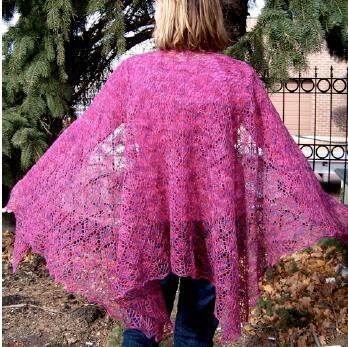 A very beautiful shawl! 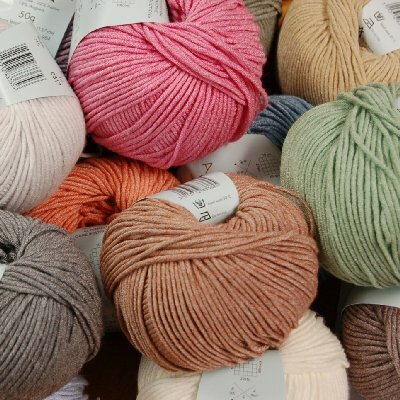 Question: What yarn would you like to see for the weekend sale starting this Friday?